600,000-10,000 B.C. Paleolithic and Mesolithic period. Earliest human remains in the area, found south of Lake Tiberias, dated to circa 600,000 B.C. 10,000-5,000 B.C. Neolithic period. Establishment of settled agricultural communities. 5,000-3,000 B.C. Chalcolithic period. Copper and stone tools and artifacts. Remains from this period found near Jericho, Beersheba, and the Dead Sea. 3,000-2,000 B.C. Early Bronze Age. Arrival and settlement of Canaanites (3,000-2,500 B.C.). ca. 1,250 B.C. Israelite conquest of Canaan. 965-928 B.C. King Solomon. Construction of the temple in Jerusalem. 928 B.C. Division of Israelite state into the kingdoms of Israel and Judah. 721 B.C. Assyrian conquest of the kingdom of Israel. 586 B.C. Judah defeated by Babylonians under Nebuchadnezzar. Deportation of its population to Babylon; destruction of the temple. 539 B.C. Persians conquer Babylonia. Some Jews allowed to return. Construction of a new temple. 333 B.C. Conquest of Persia by Alexander the Great brings Palestine under Greek rule. 323 B.C. Death of Alexander leads to alternate rule by Ptolemies of Egypt and Seleucids of Syria. 165 B.C. Maccabees revolt against the Seleucid ruler Antiochus Epiphanes and go on to establish independent Jewish state. 63 B.C. Incorporation of Palestine into the Roman Empire. A.D. 70 Destruction of the Second Temple by Roman Emperor Titus. 132-135 Bar Kokhba revolt suppressed. Jews barred from Jerusalem and Emperor Hadrian builds new pagan city of Aelia Capitolina on its ruins. 330-640 Palestine under Byzantine rule: Jerusalem and Palestine increasingly Christianized. 638 Arabs under the Caliph ‘Umar capture Palestine from Byzantines. 661-750 Umayyad caliphs rule Palestine from Damascus. Dynasty descended from Umayya of Meccan tribe of Quraysh. Construction of Dome of the Rock in Jerusalem by Caliph ‘Abd al-Malik (685-705). Construction of al-Aqsa mosque in Jerusalem by Caliph al-Walid I (705-715). 750-1258 ‘Abbasid caliphs rule Palestine from Iraq. Dynasty, founded by Abu al-‘ Abbas al-Saffah, who is descended from’ Abbas, uncle of the Prophet. 969 Fatimid dynasty, claiming descent from the Prophet’s daughter Fatima and her cousin ‘Ali, rule Palestine from Egypt. They proclaim themselves caliphs in rivalry to the’ Abbasids. 1071 Saljuqs, originally from Isfahan, capture Jerusalem and parts of Palestine, which remains officially within the ‘Abbasid Empire. 1099-1187 Crusaders establish the Latin Kingdom of Jerusalem. 1187 Kurdish general Saladin (Salah al-Din who was born in Takrit northern Iraq, the birth place of Saddam Hussein too), son of Ayyub, the sultan of Mosul, defeats Crusaders at Hittin in northern Palestine and recaptures Jerusalem. The Ayyubid dynasty rules Palestine from Cairo. 1260 Mamluks succeed Ayyubids, ruling Palestine from Cairo; defeat Mongols at Battle of ‘Ayn Jalut near Nazareth. 1291 Mamluks capture final Crusader strongholds of Acre and Caesarea. 1516-1917 Palestine incorporated into the Ottoman Empire with its capital in Istanbul. 1832-1840 Muhammad ‘Ali Pasha of Egypt occupies Palestine. Ottomans subsequently reassert their rule. 1876-1877 Palestinian deputies from Jerusalem attend the first Ottoman Parliament in Istanbul, elected under a new Ottoman Constitution. 1878 The first modern Zionist agricultural settlement of Petach Tiqwa established (click here to learn more about Zionist and its impact on the Palestinian people). 1882-1903 First wave of 25,000 Zionist immigrants enters Palestine, coming mainly from eastern Europe. 1882 Baron Edmond de Rothschild of Paris starts financial backing for Jewish settlement in Palestine. 1887-1888 Palestine divided by Ottomans into the districts (sanjaks) of Jerusalem, Nablus, and Acre. The first was attached directly to Istanbul, the others to the wilayet of Beirut. 1896 Theodor Herzl, an Austro-Hungarian Jewish journalist and writer, publishes Der Judenstaat, advocating establishment of a Jewish state in Palestine or elsewhere. 1896 Jewish Colonization Association, founded in 1891 in London by German Baron Maurice de Hirsch, starts aiding Zionist settlements in Palestine. 1897 First Zionist Congress in Switzerland issues the Basle Program calling for the establishment of a “home for the Jewish people in Palestine.” It also establishes the World Zionist Organization (WZO) to work to that end. 1901 Jewish National Fund (JNF) set up by fifth Zionist Congress in Basle to acquire land for WZO; land acquired by JNF to be inalienably Jewish, and exclusively Jewish labor to be employed on it, click here to read to Zionist apartheid & racist quotes. 1904-1914 Second wave of about 40,000 Zionist immigrants increases Jewish population in Palestine to about 6% of total. Since the inception of Zionism it has been claiming that Palestinian was an empty country, click here to read our rebuttal to this argument. 1909 Establishment of the first kibbutz, based exclusively on Jewish labor. Tel Aviv founded north of Jaffa. 1914 World War I starts. 1916 30 January Husayn-McMahon correspondence between Sharif Husayn of Mecca (leader of the Arab Revolt against the Ottomans) and Sir Henry McMahon (British High Commissioner of Egypt) ends in agreement for postwar independence and unity of Arab provinces of Ottoman Empire. 16 May Sykes-Picot Agreement secretly signed, dividing Arab provinces of Ottoman Empire between Britain and France. Agreement revealed by Bolsheviks in December 1917. June Sharif Husayn proclaims Arab independence from Ottomans. Arab Revolt against Istanbul begins. 1917 2 November Balfour Declaration. British Secretary of State Balfour pledges British support for “a Jewish national home in Palestine.” 1918 September Palestine occupied by Allied forces under British General Allenby. 30 October World War I ends. 1919-1923 Third wave of over 35,000 Zionist immigrants increases Jewish population in Palestine to 12% of total. Registered Jewish landownership (1923) totals 3% of area of country. 1919 27 January-10 February First Palestinian National Congress in Jerusalem sends memoranda to Paris Peace Conference rejecting Balfour Declaration and demanding independence. 28 August Paris Peace Conference sends Commission of Inquiry to Near East, led by U.S. commission members Henry C. King and Charles Crane. England and France decline to participate. Commission recommends “serious modification” of idea of “making Palestine distinctly a Jewish Commonwealth.” 1920 April Disturbances in Palestine; 5 Jews killed, 200 wounded. British appoint Palin Commission of Inquiry .Commission report attributes troubles to none fulfillment of promises of Arab independence and fear of political and economic consequences of Zionism. 25 April Palestine Mandate assigned to Britain by Supreme Council of San Remo Peace Conference. May British prevent Second Palestinian National Congress from convening. 1 July High Commissioner, Sir Herbert Samuel, an Anglo-Jewish politician, inaugurates British civilian administration. December Third Palestinian National Congress, meeting in Haifa, elects Executive Committee, which remains in control of Palestinian political movement from 1920 to 1935. 1921 March Founding of the Haganah, the Zionists’ illegal underground military organization. 1 May Disturbances in Jaffa protesting large-scale Zionist immigration; 46 Jews killed, 146 wounded. British Haycraft Commission of Inquiry (October) attributes disturbances to fears of Zionist mass immigration. 8 May Haj Amin al-Husayni appointed Multi of Jerusalem. May-June Fourth Palestinian National Congress, convening in Jerusalem, decides to send a Palestinian delegation to London to explain the Palestinian case against the Balfour Declaration. 1922 3 June British colonial secretary Winston Churchill issues White Paper excluding Transjordan from scope of Balfour Declaration. Ignoring political criteria, White Paper authorizes Jewish immigration according to “economic absorptive capacity” of the country. 24 July League of Nations Council approves Mandate for Palestine. August Fifth Palestinian National Congress, meeting in Nablus, agrees to economic boycott of Zionists (see 1901 entry on JNF). October First British census of Palestine shows population of 757,182 -78% Muslim Arab, 11% Jewish, 9.6% Christian Arab. It is often claimed that Palestine was empty until Zionist Jews made the Palestinian desert bloom, click here to read our response to this argument. 1923 29 September British Mandate for Palestine comes officially into force. 1924-1928 Fourth wave of 67,000 Zionist immigrants, over 50% from Poland, increases Jewish population of Palestine to 16% of total. Registered Jewish landownership (1928) totals 4.2% of area of country. Click here to view a map illustrating a breakdown of Palestinian-Zionist landownership per district as of 1945. 1925 Revisionist Party, founded in Paris by Polish Zionist Vladimir Jabotinsky, demands establishment of Jewish state in Palestine and Transjordan and stresses military aspects of Zionism. October Sixth Palestinian National Congress convenes in Jaffa. 1928 June Seventh Palestinian National Congress convenes in Jerusalem. 1929-1939 Fifth wave of over 250,000 Zionist immigrants increases Jewish population in Palestine to 30% of total. Registered Jewish landownership (1939) totals 5.7% of area of country. 1929 August Riots arise out of dispute between Jews and Palestinians over claims to Wailing (Western) Wall in Jerusalem, a site holy to Muslims and Jews. In resulting clashes 133 Jews killed and 339 wounded, 116 Palestinians killed and 232 wounded, the latter mainly by British military . October General Palestinian conference meets in Jerusalem to formulate position on Wailing Wall controversy. 1930 14 January League of Nations appoints international commission to investigate legal status of Arabs and Jews at Wailing Wall. March British Shaw Palestinian Commission of Inquiry attributes 1929 disturbances to Palestinian fears of Jewish immigration “not only as a menace to their livelihood but as a possible overlord of the future.” October British Hope-Simpson report on land settlement, immigration, and development in Palestine concludes that there is not sufficient agricultural land for substantially increased numbers of Jewish settlers. British Colonial Secretary , Lord Passfield, issues White Paper which takes note of views of Hope-Simpson and Shaw commissions of inquiry. 1931 Irgun Zvai Leumi (National Military Organization), Irgun or IZL for short, founded by Revisionist groups and dissidents from Haganah, advocates a more militant policy against Palestinians. Valdimir Jabotinsky is commander-in-chief. 14 February British prime minister Ramsay MacDonald in a letter to Zionist leader Chaim Weizmann virtually retracts Passfield White Paper. 18 November Second British census of Palestine shows population of 1,035,154-73% Muslim Arab, 16.9% Jewish, 8.6% Christian Arab. December Lewis French, British director of development for Palestine, publishes report on “landless Arabs,” caused by Zionist colonization. 1933 14 July British Secretary of State issues statement on resettlement of Palestinian farmers displaced from land acquired by Zionists. 1935 October Revisionists quit World Zionist Organization (WZO) to form New Zionist Organization with aim of “liberating” Palestine and Transjordan. November Shaykh ‘Izz al-Din al-Qassam, Muslim cleric from Haifa, leader of first Palestinian guerrilla group fighting British policy in Palestine, killed in action against British security forces. 1936 25 April Leaders of Palestinian political parties form Higher Arab Committee under Chairman Haj Amin al-Husseini. 8 May Conference of Palestinian National Committees in Jerusalem calls for no taxation without representation. Great Rebellion begins. 25 August Lebanese guerrilla leader Fawzi al-Qawuqji enters Palestine leading 150 volunteers from Arab countries to help fight British. 11 November Royal Commission headed by Lord Peel arrives in Palestine. 1937 18 January Royal Commission leaves Palestine. April IZL/Irgun, linked to Revisionist movement under Ze’ev Jabotinsky, reorganizes and advocates armed attacks on Palestinians. 7 July Royal (Peel) Commission report recommends partitioning Palestine into Jewish state comprising 33% of country including Haifa, Galilee, and coastal plain north of Isdud; Arab state in rest of country (to become part of Transjordan); and British mandatory enclaves including Jerusalem. Part of Palestinian population to be forcibly transferred, if necessary, from Jewish state, click here to learn how deeply the concept of “transfer” (Ethnic Cleansing) is entrenched in the Zionist theology. 23 July Arab Higher Committee rejects Royal Commission proposal and demands independent unitary Palestine with protection of “legitimate Jewish and other minority rights” and the safeguarding of British interests. Rebellion intensifies. September Arab National Congress at Bludan, Syria, attended by 450 delegates from Arab countries, rejects partition proposal, demands end to Mandate, a stop to Zionist immigration, and prohibition of transfer of Palestinian lands to Zionist ownership. 1 October British dissolve Arab Higher Committee and all Palestinian political organizations. Five Palestinian leaders deported. Haj Amin al-Husayni escapes to Lebanon. 11 November British establish military courts to counter Palestinian rebellion. 1938 April-August IZL/Irgun bombings kill 119 Palestinians. Palestinian bombs and mines kill 8 Jews. June British officer Orde Wingate organizes Special Night Squads of British and Haganah personnel for operations against Palestinian villages. 18 October British military commanders take over administration from district commissioners to help suppress rebellion. Reinforcements brought from England. 19 October British recapture Old City of Jerusalem from Palestinian rebels. 9 November Report of British Woodhead technical commission of inquiry (January-April 1938) declares impracticability of Royal Commission’s partition proposal. British call for general conference on Palestine in London attended by Arabs, Palestinians, and Zionists. 1939 7 February London Conference starts. 27 March London Conference ends without agreement. 22-23 May British House of Commons votes 268 to 179 in favor of White Paper issued by Colonial Secretary of State Malcolm MacDonald. White Paper calls for conditional independence for unitary Palestinian state after ten years; admission of 15,000 Jewish immigrants annually into Palestine for five years, with immigration after that subject to “Arab acquiescence” ; protection of Palestinian land rights against Zionist acquisition. British official estimates of Palestinians killed or executed by British military and police during Arab Rebellion is over 2,000 for 1936 and 1938 alone. Total for all years is estimated at 3,500-4,000. About 500 Jews killed in same period. 1 September World War 11 begins. October Stern Gang or Lochemay Herut Yisra’el (LEHI; “Fighters for the Freedom of Israel”) formed by dissident IZL members led by Avraham Stern. 1940-1945 Arrival of over 60,000 Zionist immigrants, including 20-25,000 who have entered the country illegally (April 1939-December 1945), increases Jewish population in Palestine to 31% of total. Registered Jewish landownership rises to 6.0% of area of country. 1940 28 February Land Transfers Regulations, suggested by 1939 White Paper to protect Palestinian land rights against Zionist acquisition, enter into force. 1942 February Avraham Stern killed by British police. It should be noted that the Stern gang received extensive financial and military support from the Nazi Germany and Fascist Italy to terrorize the British Mandate in Palestine. Click here to learn more about the subject. May Biltmore Conference in New York attended by Zionist leaders from U.S. and Palestine, urges that “Palestine be established as a Jewish commonwealth.” 1943 November Five-year limit on Jewish immigration (expiring April 1944) extended so all 75,000 visas permitted in 1939 White Paper can be filled. 1944 January Stern Gang and IZL join to conduct terror campaign against British. 6 November Stern Gang murders Lord Moyne, British resident minister of state, in Cairo. 1945 8 May End of World War in Europe. September Large-scale illegal Jewish immigration into Palestine resumes under Haganah control. 13 November British foreign secretary Ernest Bevin issues White Paper announcing continued Jewish immigration into Palestine after exhaustion of 1939 White Paper quota. 1946 6 March Anglo-American Committee of Inquiry, proposed in 1945 White Paper, arrives in Palestine. May Anglo-American Committee report estimates size of Jewish armed forces at around 61-69,000 people (Haganah: 58-64,000; IZL: 3-5,000; Stern: 2-300) and declares “private armies” illegal. Recommends admission of 100,000 Jews into Palestine and abolition of Land Transfers Regulations. Palestinians strike in protest. 11-12 June Arab League meeting in Bludan, Syria, adopts secret resolutions warning Britain and U .S. that disregard for Palestinian rights will damage their oil and commercial interests in Arab world. July British White Paper on terrorism in Palestine accuses Haganah of cooperating with IZL and Stern Gang in acts of sabotage and violence. 22 July Ninety-one British, Palestinian, and Jewish civil servants and visitors killed when IZL blows up wing of King David Hotel in Jerusalem housing British government secretariat. 31 July Anglo-American Conference in London produces Morrison-Grady Plan proposing federal scheme to solve Palestine problem. Zionist and Palestinian leaders reject the plan. 26 January London Round Table conference reopens. 7-10 February British foreign secretary Ernest Bevin proposes variant of Morrison-Grady Plan to London Conference and Jewish Agency. Arab delegates in London and Jewish Agency reject proposal. 18 February Bevin announces submission of Palestine problem to United Nations. 28 April-15 May UN General Assembly special session on Palestine problem leads to appointment of eleven-member Special Committee on Palestine (UNSCOP). 8 September Publication of UNSCOP report. Majority of members recommends partition, minority recommends federal solution. 16-19 September Arab League denounces UNSCOP partition recommendation, and appoints Technical Military Committee to supervise Palestinian defense needs. 26 September Arthur Creech Jones, British colonial secretary, announces Britain’s decision to end Palestine Mandate. 29 September Arab Higher Committee rejects partition. 2 October Jewish Agency accepts partition. 7-15 October Arab League meets at Aley, Lebanon. Iraqi General Isma’il Safwat, chairman of Technical Committee, warns of dangers posed by Zionism at end of Mandate and urges Arab states to mobilize their utmost force and efforts to counter Zionist intentions.” One million pounds sterling allocated to Technical Military Committee. 29 October Britain says it will leave Palestine in six months if no settle- ment reached. 27 November Report by Safwat warns of virtual impossibility of overcoming Zionist forces with irregulars; urges prompt Arab action in organizing military force; advocates training Palestinians to defend themselves. 29 November UN General Assembly recommends variant of UNSCOP partition plan allocating 56.5% of Palestine to Jewish state and 43% to Arab state with international enclave around Jerusalem; 33 votes for, 13 against, 10 abstentions. Arab representatives walk out (Click here to read more why Arabs rejected the U.N. partition plan). 30 November Haganah calls up Jews in Palestine aged 17-25 to register for military service. December Arab League organizes Arab Liberation Army (ALA), a voluntary force of Arab irregulars under guerrilla leader Fawzi al-Qawuqji to help Palestinians resist partition. 2 December Palestinians start three-day strike protesting UN Partition Resolution. Intercommunal clashes leave 8 Jews and 6 Palestinians dead. 8 December Britain recommends to UN that Palestine Mandate be terminated on 15 May 1948 and independent Jewish and Palestinian states be established two weeks later. 8-17 December Arab League Political Committee meeting in Cairo declares partition illegal and resolves to provide 10,000 rifles, 3,000 volunteers (including 500 Palestinians) and a further 1,000,000 pounds sterling to Technical Military Committee. 15 December British announce intention to hand over policing in Tel Aviv-Petach Tiqwa area to Jews and in Jaffa to Palestinians. 17 December Jewish Agency Executive reports that American Jews will be asked for $250 million to help Jewish community in Palestine. 21 December-late March 1948 Haganah and IZL attack villages and Bedouin settlements of coastal plain north of Tel Aviv in first coastal “clearing” operation. 31 December Haganah and IZL paramilitary gangs perpetrate Balad al-Shaykh (Haifa) massacre, in which more than 60 civilians are murdered. December 1947-January 1948 Arab Higher Committee organizes 275 local committees for defense of Palestinian towns and villages. January Palestinian guerrilla leader ‘Abd al-Qadir al-Husayni secretly returns to Palestine after ten-year exile to organize resistance to partition. 8 January First contingent of 330 ALA volunteers arrives in Palestine. 10 January ALA assault on Jewish settlement of Kefar Szold repulsed with help of British. 14 January Haganah concludes arms deal with Czechoslovakia for $12,280,000 worth of arms including 24,500 rifles, 5,000 light machine guns, 200 medium machine guns, 54 million rounds of ammunition, 25 Meserschmitts. By end of Mandate at least 10,740 rifles, 1,200 machine guns, 26 field guns, and 11 million rounds of ammunition arrive in Palestine. Rest of arms arrive by end of May. 16 January British report to UN estimates 1,974 people killed or injured in Palestine from 30 November 1947-10 January 1948. 20 January British administration announces that predominantly Jewish or Palestinian areas will be gradually handed over to local majority group in every area concerned. 21 and 28 January Second and third contingents of 360 and 400 ALA irregulars arrive in Palestine. January-March JNF leaders encourage evictions from villages of Haifa area Haganah attacks villages near Lake al-Hula. Palmach attacks Negev Bedouin. 16 February ALA mounts unsuccessful attack on Jewish settlement of Tirat Zvi north of Baysan. 18 February Haganah calls up men and women aged 25-35 for military service. 24 February U.S. delegate to UN says Security Council role should be to keep peace in Palestine, not enforce partition. Syrian delegate suggests appointing committee to explore possible Jewish Agency-Arab Higher Committee agreement. March Transjordanian prime minister Tawfiq Abu al-Huda secretly meets British foreign secretary Bevin. They agree that Transjordanian forces will enter Palestine at end of Mandate but will restrict themselves to area of Arab state outlined in partition Plan. (Click here to read our response to the Zionist claim that seven Arab armies attempt to annihilate the newly emerging “Jewish State”) 5-7 March Qawuqji enters Palestine and assumes command of ALA units in Jinin-Nablus-Tulkarm triangle within area allotted to Arab state. 6 March Haganah declares general mobilization. 10 March British House of Commons votes to end Mandate on 15 May. Plan Dalet finalized by Haganah. Plan provides for military conquest of area allotted by UN Partition Plan to Jewish state and of substantial Palestinian territories beyond this state’s boundaries. Plan contains a series of interlocking operations. 18 March President Truman secretly receives Chaim Weizman and pledges support for declaration of Jewish state on May 15. 19-20 March U.S. delegate asks UN Security Council to suspend action on partition plan and to convene General Assembly special session to work on a trusteeship plan. Arabs accept limited trusteeship and truce if Jews also accept. Jewish Agency rejects trusteeship. 25 March President Truman calls for immediate truce and says U.S. will share responsibility for temporary trusteeship. 30 March-15 May Second coastal “clearing” operation carried out by Haganah Alexandroni brigade and other units. Attacks and expulsions drive out almost all Palestinian communities from coastal area from Haifa to Jaffa prior to British withdrawal. 1 April Delivery of first consignment of Czech arms deal: Ship “Nora” arrives in Haifa from Yugoslavia with 4,500 rifles, 200 light machine guns, 5 million rounds of ammunition. Two hundred rifles, 400 machine guns and further ammunition ferried in by airplane. UN Security Council resolutions call for special session of General Assembly and agree to U.S. proposal for truce to be arranged through Jewish Agency and Arab Higher Committee. 4 April Haganah launches Plan Dalet. 4-15 April Battle of Mishmar ha-‘Emeq: ALA repulsed by Haganah from Jewish settlement of Mishmar ha-‘Emeq. Haganah, Carmeli, Alexandroni, and Palmach units occupy villages in Marj ibn ‘Amir. 6-15 April Operation Nachshon: In first operation of Plan Dalet Haganah Giv’ati Brigade and other units capture villages along Tel Aviv-Jerusalem road from local Palestinian militia. 8 April ‘Abd al-Qadir al-Husayni, charismatic Palestinian militia commander, Jerusalem district, is killed leading counterattack to recover al-Qastal village. 9 April IZL and Stern Gangs massacre some 250 inhabitants in village of Dayr Yasin near Jerusalem. 12 April General Zionist Council decides to establish independent state in Palestine on 16 May. 13-20 April Operation Har’el under Plan Dalet launched at conclusion of Operation Nachshon. Villages along Jerusalem road attacked and demolished. All subsequent Haganah operations until 15 May 1948 undertaken within framework of Plan Dalet. 15 April-25 May Operation Yiftach: Palmach captures Safad from ALA and local militia (9-10 May). Attacks and psychological warfare used to empty villages of eastern Galilee and Galilee panhandle. Operation Matate (Broom) drives out Bedouin and villagers from area south of Rosh Pinna to Jordan River. 16-17 April Haganah Golani brigade and Palmach units capture Tiberias as it is evacuated by British. 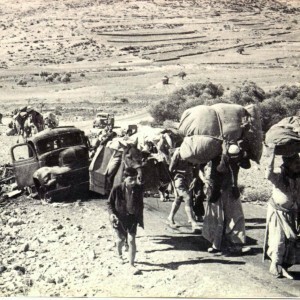 Palestinian inhabitants flee. 17 April Security Council resolution calls for military and political truce. 20 April U.S. submits Palestine trusteeship plan to UN. 21 April Operation Misparayim (meaning scissor): British forces suddenly withdraw from Haifa precipitating all-out Haganah dawn offensive against city’s Palestinian population. Offensive accompanied by heavy mortar shelling of Palestinian residential quarters. 22 April Resistance of local Palestinian militia in Haifa collapses. Haifa’s Palestinian population flees under combined Haganah shelling and ground offensives. 25 April IZL starts massive mortar shelling of Jaffa‘s residential quarters; simultaneously launches ground offensive to cut off northern Manshiyeh quarter from rest of city. 26-30 April Haganah Har’el and Etzioni brigades launch Operation Yevussi in and around Jerusalem; attack East Jerusalem residential quarter of Shaykh Jarrah but are forced to hand it over to British; capture West Jerusalem residential district of Qatamon from Palestinian irregulars. Flight of Palestinian inhabitants. 27 April-5 May Operation Chametz: Haganah launches major ground offensive against eastern Jaffa suburbs and neighboring villages to cut off city from its hinterland. Some 50,000 civilians flee under combined IZL and Haganah attacks. 30 April All Palestinian quarters in West Jerusalem occupied by Haganah and residents driven out. 1 May The Zionists forces occupied and massacred more than 70 civilians from ‘Ayn al-Zaytun (Safad). 3 May 175-200,000 Palestinian refugees reported to have fled from areas taken by Zionists. 8-16 May Haganah Har’el and Giv’ati brigades undertake Operation Makkabi. Capture villages on al-Ramla-Latrun road. 9 May-1 June Operation Barak: Strikes by Haganah Giv’ati and Negev brigades south and West of al-Ramla. 10-15 May Golani brigade occupies Baysan, attacks villages of Baysan Valley south of Lake Tiberias. 12-14 May Arrival of second and third Czech arms consignments for Haganah: 5,000 rifles, 1,200 machine guns, 6 million rounds of ammunition. 13 May Arab Legion, ALA, and local militia attack and capture Jewish settlements of Etzion bloc, retaliating for attacks on Hebron road. Jaffa formally surrenders to Haganah. 13-21 May Operation Ben-Ami: Carmeli brigade occupies Acre and coastal area north of city . 14 May Haganah launches Operation Qilshon (Pitchfork), occupying strategic areas in Jerusalem evacuated by British and taking Palestinian residential quarters outside Old City from Arab irregulars. Haganah launches Operation Schfifon to take Old City of Jerusalem. State of Israel proclaimed in Tel Aviv at 4:00 P.M. President Truman recognizes state of Israel. 15 May British Mandate ends. Declaration of State of Israel comes into effect. 15-17 May Lebanese regulars cross border and temporarily retake villages of Malikiyya and Qadas from Haganah, but are forced out of fortress of Nabi Yusha’. 15-28 May Transjordanian Arab Legion troops cross River Jordan and move towards Jerusalem capturing Jewish settlements of Atarot and Newe Ya’aqov north of city (17 May). In Jerusalem, Legion retakes Shaykh Jarrah quarter (16 May), fails to capture stronghold in Notre Dame monastery (17-25 May), and takes control of Jewish Quarter of Old City (28 May). On the 23th of May 1948, al-Tantura was perpetrated against 250 civilians and POWs. 15 May-4 June Iraqi units cross Jordan River, are repulsed from Crusader fortress of Belvoir , and besiege settlement of Gesher for a week. Iraqi regulars move into Nablus-Jinin- Tulkarm triangle 24 May). Haganah advances on Jinin, evicting villagers (28-31 May); it attacks and briefly occupies Jinin before being repulsed (3-4 June). 15 May-7 June Egyptian regular troops cross border, move up coast to Isdud and capture Jewish settlements of Yad Mordechai (24 May) and Nitzanim (7 June) in Negev. Another column of Egyptian irregulars moves to Bethlehem linking up with Arab Legion. In battle with IDF (21-25 May), Jewish settlement of Ramat Rachel south of Jerusalem changes hands several times and is finally retained by Jews. 16 May-10 June Syrian columns advance over border and temporarily capture Jewish settlement of Zeniach (18-20 May), are repulsed from twin settlements of Degania (20 May), and capture settlement of Mishmar ha-Yarden (10 June). Syrians, Lebanese, and ALA recapture Malikiyya (6 June). 16-30 May IDF Operation Ben-Nun: Israeli Sheva’ and other brigades fail to capture al-Latrun from Arab Legion in attempt to open Jaffa-Jerusalem road, but occupy villages in vicinity. 20 May UN Security Council appoints Count Folke Bernadotte as its mediator in Palestine. 22 May UN Security Council resolution calls for ceasefire. 9-10 June IDF Operation Yoram, launched against Arab legion by Har’el and Yiftach brigades, fails to capture al-Latrun. 11 June-8 July First Truce. 28-29 June Count Bernadotte suggests economic, military, and political union of Transjordan and Palestine containing Arab and Jewish states: Negev and central Palestine to go to Arabs; Western Galilee to Jews; Jerusalem to be part of Arab state with administrative autonomy for Jews; Haifa and Jaffa to be free ports and Lydda free airport. Rejected by both sides. 7 July Security Council calls for prolongation of truce. 7-18 July IDF Operation Dani: Capture of Lydda and al-Ramla from local militia. Population of both cities expelled. Three or four IDF brigades occupy villages along Jerusalem-Jaffa road and cluster of villages east of Jaffa. Yiftach brigade’s assault on Arab Legion in al-Latrun (17 July) ends with Second Truce. 8-14 July IDF Operation Dekel: Carmeli and Sheva’ brigades push east and south from Acre, capture Nazareth from ALA under Qawuqji and occupy Lower Galilee. 8-11 July IDF Operation An-Far: Giv’ati brigade, moving against Egyptians, empties villages south of al-Ramla in an arc between Hebron hills and coast. 9-18 July IDF Carmeli Brigade fails to recapture the Zionist settlement of Mishmar ha-Yarden, south of Lake Tiberias, that had been occupied by Syrian troops. 15 July UN Security Council resolution calls on governments and authorities concerned to issue indefinite ceasefire orders to their forces in Palestine to take effect within three weeks. 17 July IDF Operation Qedem against Old City of Jerusalem is repulsed. 18 July-15 October Second Truce. 24-26 July IDF Operation Shoter: Carmeli, Alexandroni, and Golani brigades attack and capture three villages of Little Triangle south of Haifa. 16 August-end of September early October Negev and Yiftach brigades attack and expel Bedouins and inhabitants of villages in Negev. 24-28 August IDF Operation Nikayon (Cleansing): Giv’ati Brigade occupies coastal area west of Yibna and north of Isdud. 16 September Report by UN mediator Count Bernadotte proposes new partition of Palestine: Arab state to be annexed to Transjordan and to include Negev, al-Ramla and Lydda; Jewish state in all of Galilee; internationalization of Jerusalem; return and compensation of refugees. Rejected by Arab League and Israel. 17 September UN mediator Count Bernadotte murdered in Jerusalem by Stern Gang. Replaced by his American deputy Ralph Bunche. 15 October-9 November IDF Operations Yo’av and ha-Har: Negev, Giv’ati, and Yiftach units move against Egyptians to capture Beersheba, Isdud, Majdal, and coastal strip as far as Yad Mordechai, and villages of Hebron Hills. Har’el brigade captures southern Jerusalem corridor. 29-31 October IDF Operation Hiram: Upper Galilee pocket, held by Qawuqji’s forces, occupied and emptied by Giv’ati, Oded, and Sheva’ brigade troops. Tens of thousands flee. Israeli forces move into southern Lebanon as far as Litani River. On the 29th of October 1948, the IDF commits the famous Safsaf (Safad) massacre in which more than 60 civilians are murdered. November IDF Har’el Brigade expels several communities in Jerusalem corridor along border with Transjordanian forces. 4 November UN Security Council resolution calls for withdrawal of forces to positions occupied prior to 14 October and establishment of permanent truce lines. Second week November-mid 1949 IDF expels inhabitants from villages 5-15 km inside Lebanese border, followed by expulsions from other Galilee villages. 22 December-6 January 1949 Operation Horev launched to drive Egyptians out of southern coastal strip and Negev. Asluj and al-‘Awja captured. Israeli troops move into Sinai until British pressure forces withdrawal. Golani and Har’el brigades attack on Rafah ended by ceasefire (7 January). 27 December IDF Alexandroni brigade’s attack on isolated Egyptian forces in Faluja pocket is repulsed. 24 February Israeli-Egyptian Armistice: Egypt keeps coastal strip Gaza Rafah and evacuates Faluja pocket; Asluj-al-‘Awja area demilitarized. End of February IDF units intimidate 2-3,000 villagers into leaving Faluja pocket in violation of Israeli-Egyptian Armistice Agreement. March IDF Negev and Golani brigades complete occupation of Negev as far as Umm Rashrash/Eilat. 23 March Israeli-Lebanese Armistice: Frontier of Mandate Palestine accepted; Israel withdraws from most of Lebanese territory. 3 April Israeli-Jordanian Armistice: Jordan takes over Iraqi-held Nablus-Jinin- Tulkarm triangle but is forced to cede area around Wadi ‘Ara; Israel controls Chadera-‘Afula road; existing status quo in Jerusalem accepted by IDF and Arab Legion. 20 July Syrian-Israeli Armistice: demilitarized zones established around ‘En Gev and Dardara (including Mishmar ha-Yarden).